Colonel Archibald Campbell Fraser (1736-1815), who succeeded his half-brother Lieutenant General Simon Fraser (1726-1782) in the Lovat estates, on his first appearance in the House of Commons in 1782, played a prominent role in supporting the motion by the Marquis of Graham, later Duke of Montrose, for the Repeal of the Unclothing Act and legalizing the use of Highland dress. Following the death of Archibald Campbell Fraser of Lovat, without legitimate surviving issue, the Lovat estates in Inverness-shire were inherited by Thomas Alexander Fraser of Strichen (1802-1875), Aberdeenshire, as nearest heir male through his descent from Alexander Fraser, 4th Lord Lovat (1527-1557). In 1837 he was created Baron Lovat in the Peerage of the United Kingdom, and in 1857 proved his claim to the Scottish title as 14th Lord Lovat. Although they cannot agree on the origins, most scholars and historians credit the influential novelist/poet Sir Walter Scott (1771-1832) with romanticizing the history of tartans. Scott, along with Major General David Stewart of Garth (1772-1829), masterminded the state visit of George IV, who became the first reigning monarch to visit Scotland since the time of Charles II. King George appeared in kilt and plaid for the royal visit in 1822, for which the firm of Wm. Wilson & Sons of Bannockburn manufactured about 150 tartans. About this time two brothers, John Sobieski Stolberg Stuart (c1795-1872) and Charles Edward Stuart (c1799-1880) arrived in Scotland, claiming to be the grandsons of Bonnie Prince Charlie (1720-1788) by Louise of Stolberg (1752-1824), to whom he was briefly married. Charles Edward Louis John Casimir Silvester Severino Maria Stuart, born 31st December 1720, was 51 when he married the 19 year-old Louise Maximiliana Emmanuela, eldest of four daughters of the widowed Princess of Stolberg-Gedern. Fraser of Lovat listened sympathetically to the brothers and indulged their pretension. In 1838 he offered them a house on the 60 acre island of Eilean Aigas, where they learned Gaelic and produced several collections of verse. In 1842 they published their ‘ancient’ work on clan tartans Vestiarium Scoticum, which formed the basis for the development of modern tartan. "Campbell [author of Tales of the West Highlands] refers to his ‘old friend John Sobieski Stuart, Count d’Albanie who first caused me to be arrayed in Highland Costume in 1825’. In this volume he wrote, ‘I do not believe that the distinctions which are now made as to Clan Tartans ever prevailed at all, till Tartan became an important manufacture in Scotland in the reign of George the 4th.’ Eleven years later, in 1882, he underlined this contention. The brothers were his friends but, as a scholar, he could not accept their Vestiarium Scoticum, despite having known them for fifty years." "The year 1825… And we had those strange brothers whose real name I can’t remember, but they one day announced that they were Stuarts, lineally descended from Prince Charles, out of respect to whose wife, who never had a child, the elder brother assumed the name of John Sobieski; the younger brother was Charles. Nobody was more astonished at this assumption than their own father, a decent man who held some small situation in the Tower of London. The mother was Scotch; her people had been in the service of the unfortunate Stuarts in Italy, and who can tell if she had not some right to call herself connected with them? "Her sons were handsome men, particularly John Sobieski, who, however, had not a trace of the Stuart in his far finer face. They always wore the Highland dress, kilt and belted plaid, and looked melancholy, and spoke at times mysteriously. The effect they produced was astonishing; they were ‘feted’ to their hearts’ content; for several years they actually ‘reigned’ in the north country. At last they made a mistake which finished the farce. "Fraser of Lovat had taken them up enthusiastically, built them a villa on an island in the Beauly Firth, in the pretty garden of which was a small waterfall. Here Mrs Charles Stuart sat and played the harp like Flora MacIvor, and crowds went to visit them. They turned Roman Catholic, to please their benefactor, I suppose, and so lost caste with the public. Poor Mrs Charles was a meek little woman, a widow with a small jointure whom the ‘Prince,’ her husband, had met in Ireland. I do not know what had taken him there, for no one knew what his employment had originally been. Prince Sobieski had been a coach painter - not the panel painter, the heraldic painter - and most beautifully he finished the coats of arms." James Thomson was born in 1825 at Rothes, Moray, son of James Thomson and Mary Stuart. In Recollections of a Speyside Parish , the author writes about having witnessed the horrific events of the Muckle Spate of 1829 as a lad not yet five years old in Aberlour, and his brief meeting with the Stuart brothers. "One of my most vivid recollections of the early days of Queen Victoria’s reign was a visit of the two men who represented themselves as legitimate grandsons of the Pretender, and were known as the Princes of Eilean Aigas. Their names were John Sobieski and Charles Edward Stuart. It is well known that Prince Charles Edward Stuart left behind him no legitimate offspring. "Amongst other gentlemen’s residences that they visited in Strathspey was Elchies. I was fortunate in being told to direct them by a footpath through the woods to Boat of Elchies. The coin that one of them put in my hand as I parted with them was long treasured by me as a priceless gift, to be worn some day upon my breast ‘when the auld Stuarts got their ain again,’ for had not my own mother’s forebears, one a Macdonald and the other a Stuart, followed the Prince and fought for him on the fatal field of Culloden? But alas! The halo that surrounded the name of bonnie Prince Charlie became dimmer and more dim as the years of Her Majesty’s reign passed by. Our early delusions die hardly. How we cling to them, even when the scales are fallen from our eyes! We are loth to give them up. Had I lived in the days of my great-grandfathers, I certainly would have done what they did, followed ‘the Prince.’ But I know now what I did not know when the Queen began her reign, that the man whose name stirred up within one emotions of loyalty and piety showed eventually that he was devoid of all virtues that make even poor men great." Leaving Eilean Aigas in 1846, the Stuart brothers were to spend the rest of their lives researching their alleged royal lineage, before returning to Scotland, to be buried in the churchyard at Eskadale, up the river from their old island home. St Mary’s at Eskadale was the first post Reformation Roman Catholic church built in the country . Thomas Alexander Fraser, 14th Lord Lovat (1802-1875) and subsequent generations of the Frasers of Lovat have been buried at Eskadale. Eilean Aigas eventually passed to the eldest son of the late Sir Hugh Fraser and Lady Antonia (Packenham) Fraser, who sold it about 1994. Lady Antonia Fraser, the author, is now married to playwright Harold Pinter. The Edinburgh Libraries and Museums Committee published Two Centuries of Highland Dress, a brochure prepared by J. Telfer Dunbar as a guide to the exhibition of the collection which he gifted to the City in 1950. "During the period of proscription the Highland dress was worn by the Highland regiments, and when it could be worn once more by the civilian the great majority of the Highlanders could not afford to make the change. 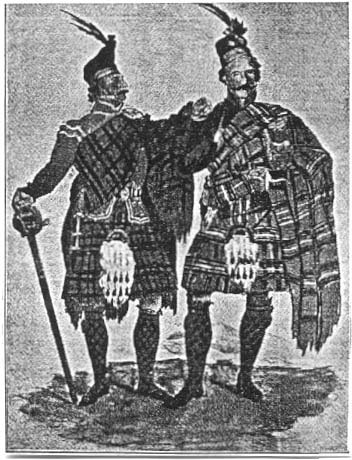 The dress then became a ‘costume’ adopted by Highlander and Lowlander alike, its style being based on the military patterns and mainly worn by those who could afford what became a romantic costume for the ballroom and the meetings of the many newly founded Highland Societies. When King George IV visited Scotland in 1822 the ‘Scottish dress’ rose to its greatest peak of popularity but it had by then degenerated considerably from the dignified clothing of our ancestors. This degeneration also applied to their weapons. When they ceased to be fighting weapons and became mere ornaments they lost their former grace and became displays of silverware and large cairngorm stones." One of the soldiers who served with the Fraser Highlanders in Canada during the Seven Years War between Britain and France (1757-63) was Duncan McCraw (1739-1803). Barbara Fraser (c1757-1824) was the widow of Hector Morrison, a British loyalist believed to have lived at Kortright’s Patent, Tryon County, New York prior to the American Revolution (1775-83). In 1779 the widow Morrison, with her children, fled to the refugee camp at Yamachiche, married McCraw and raised a second family. As part of the introduction to the genealogy of his ancestor, Yvan Goulet has written about Scotland, and he wanted some advice about how to describe the various articles of Highland dress. 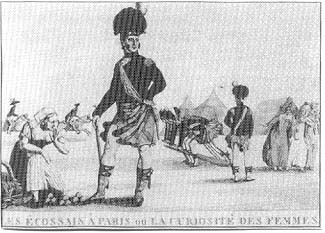 He noted that during the occupation of Paris in 1816 [after the Napoleonic Wars], the Highlanders proved to be very popular, especially to the women, whose curiosity knew no bounds. Qu’y a-t-il sous le philibeg ou kilt ? Après Waterloo, les Alliés occupèrent une grande partie du territoire français : Anglais, Prussiens, Russes, Autrichiens, même Badois, Bavarois, Hessois, Suisses, Piémontais. Les Britanniques, très disciplinés, occupaient Paris. Parmi eux, les Highlanders étaient tout particulièrement populaires. Une gravure en montre un, grand gaillard; le vent soulève un pan de son kilt jusqu’au trois quarts de la cuisse. À son côté, genou en terre, une jeune femme regarde… en admiration. Chercherait-t-elle la présence de quelque vêtement de dessous ? L’empereur de Russie, lui, fit venir au palais de l’Élysée un sergent, un cornemuseur et un simple soldat, en provenance des 42ème, 79ème et 92ème régiments. Il s’intéressa surtout aux bas, aux guêtres et aux jambes du sergent Thomas Campbell. L’écrivain John Telfer Dunbar rapporte qu’après avoir pincé la peau de l’homme—pensant qu’il portait quelque chose sous le kilt—il releva ledit kilt "pour être sûr de son affaire". Neil Fraser, président de la Société Clan Fraser du Canada, écrit, relativement au port du costume à notre époque: "Sous-vêtement highland: tres difficile à décrire - étant donné la rareté des éléments d’information". Il raconte aussi que Madame St-John, consul de Jamaïque à Toronto, lors d’une visite au château d’Édimbourg, glissa un £5.00 à un highlander placé en sentinelle pour voir ce qu’il portait sous le kilt—et il accepta. Elle déclara, avec un grand éclat de rire : "Ç’a été ma dépense la plus avantageuse à Édimbourg !"